It's not too difficult to make the marine VHF Demek / Shipmate RS 8100 suited for the recepton of AIS by adding a discriminator output. 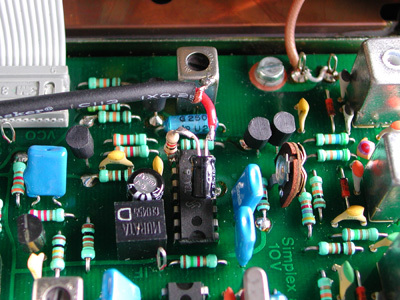 The receiver IC, a TBA120S, can be found at the bottom side of the top circuit board. To reach the bottom side, two screws need to be removed, after which the top board can be expanded. The baseband audio can be found on pin 8 of the receiver IC. 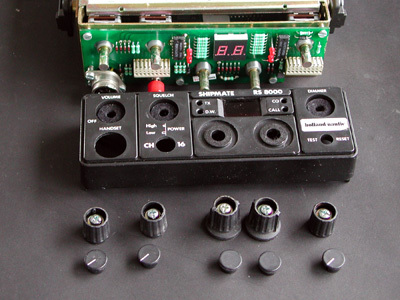 The 3.5 mm chassis socket can be mounted in the front panel without drilling, at the spot of the (obsolete) SELCAL test/reset button. To reach this spot, the front needs to be removed. When the caps of the dials are removed, the dials can be taken off the front by loosening their screws. 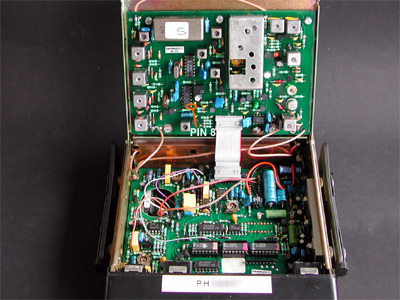 By removing the four screws on the side, the front panel can be taken apart from the chassis. Because the front panel is rather thick, the chassis terminal can be fixed to the panel with some glue from a glue gun. To align the chassis terminal's tip with the front, if needed , some plastic can be milled from the inside.